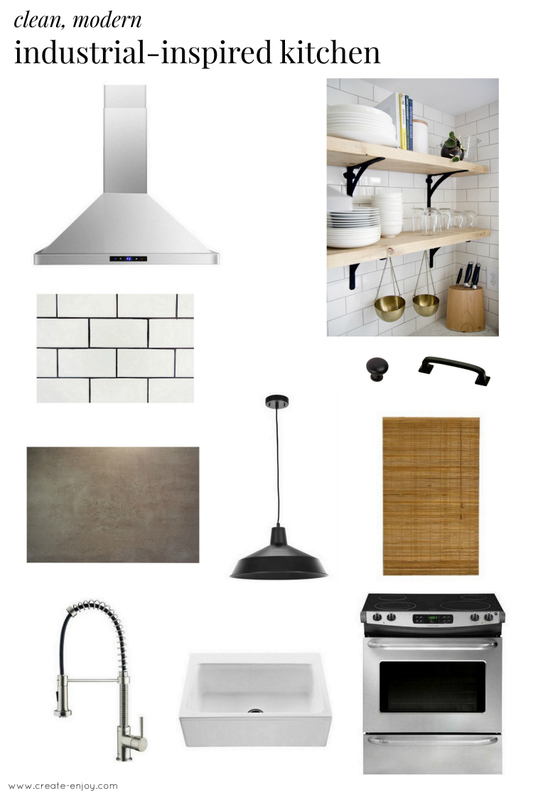 You guys, I just have so many ideas spinning around in my head (and on my dream kitchens pinboard) that I had to make this mood board for myself! I couldn't even settle on an overall style, or a word to describe the style we wanted, until I put all my ideas in one place. Despite loving so many of those dream kitchens, not a single one has every element we've decided we want. But now I think I've got it almost figured out! Part of the problem was, husband doesn't love all my absolute favorites, the all-white kitchens. They're too stark or too girly for him. But he does like a lot of the things I want in a kitchen, so we've found a blend of things that work for both of us. Key elements: white subway tile, darker grout, open shelving, black cabinet hardware, white farmhouse sink, industrial/barn lighting rather than something fancier/more glam, this very cool affordable vent hood, and a bamboo window blind. I've decided the look is sort of clean, sort of modern, sort of industrial... that's what I'm calling it. By the way that photo of those lovely shelves is from Jen Loves Kev's kitchen reveal! Compiling all these ideas visually was really helpful, and I think I may need to do it for the rest of the rooms, too! Have you ever made a mood board? Any tips for me in decorating our spaces from scratch? Anyone know of any kitchen remodels I should look at? All of these pieces are affordable! Shop them here.